Albrecht (Albert) of Brandenburg-Ansbach, 37th Grand Master of the Teutonic Order and first Duke of Prussia (Herzog von Preußen), was born 16 May 1490 at Ansbach, Bavaria, the son of Friedrich (Frederick) V, Margrave of Brandenburg-Ansbach (1460-1536) and Sofie of Poland (1464-1512), daughter of Casimir IV of Poland. Albrecht was raised for a career in the church and was appointed canon of the Cologne Cathedral. In 1511 he was chosen to succeed Friedrich, Duke of Saxony (1473-1510) as Grand Master of the Teutonic Order. In 1525 Albrecht joined the Lutherans after a period of leaning toward Schwenckfeldianism. He secularized the Teutonic Order's remaining Prussian territories and assumed the hereditary rights to the duchy of Poland. Albrecht offered domicile to the Anabaptists in his country (Prussia), which had been greatly impoverished in the Polish-Prussian war (1519-1521), and permitted them to settle in East Prussia near Bardeyn, not far from the town of Preussisch-Holland. But in an otherwise entirely orthodox Lutheran state, this colony was an object of annoyance to the clergy. The duke turned to Martin Luther in 1532 for an exposition of John 6, but received no reply for over a year. Luther finally advised against toleration. On 12 June 1533 he replied to Luther. Until 1535 the margrave followed a policy of toleration, but in 1535 exaggerated reports on Münster caused him to have the Anabaptists expelled by an order of 23 October 1535. But the officials, unwilling to weaken the depopulated land, did not carry out the orders very strictly. They persuaded the duke to permit a new settlement of Anabaptists in 1539 in the village of Schönberg in the same vicinity. However, the duke again yielded to the clergy and in 1543 ordered these settlers banished unless they recanted. Also the later immigrant Mennonites from Holland, who settled in Schönberg as early as 1545 and later (1556-1558) at Drausensee and Ellerwald, were repeatedly hit by edicts of expulsion, in consequence of which they may have settled in the adjacent Polish territory. Albrecht died 20 March 1568 and was succeeded by his son Albrecht Friedrich. Hege, Christian and Christian Neff. Mennonitisches Lexikon, 4 vols. Frankfurt & Weierhof: Hege; Karlsruhe: Schneider, 1913-1967: v. I, 19. Kolde, Th. Analecta Lutherana: Briefe und Actenstücke zur Geschichte Luthers. Gotha, F.A. Perthes, 1883: 137-139. Niederländische Ansiedlungen im Herzogtum Preussen z. Z. Herzog Albrechts. Leipzig, 1903. Penner, Horst. Ansiedlung mennonitischer Niederländer im Weichselmündungsgebiet von der Mitte des 16. Jahrhunderts bis zum Beginn der preussischen Zeit. Weierhof: Mennonitischen Geschichtsverein, 1940. Penner, Horst. "The Anabaptists and Mennonites of East Prussia," Mennonite Quarterly Review 22 (1948): 212-25. Randt, Erich. Die Mennoniten in Ostpreussen und Litauen bis zum Jahre 1772. Königsberg: Otto Kümmel, 1912. Schultz, S. G. Caspar Schwenckfeld von Ossig. Norristown, PA: 1948. Thudichum, Friedrich von. Die Deutsche Reformation, 1517-1537. Leipzig : Max Sängerwald, 1907-1909: v. II, 540. Tschackert, Paul. Urkundenbuch zur Reformationsgeschichte des herzogthums Preussen. 1890: v. II, 202 f., No. 994 and No. 999. Reprinted: Osnabrück : Zeller, 1965. Hege, Christian and Richard D. Thiessen. "Albrecht, Duke of Prussia (1490-1568)." Global Anabaptist Mennonite Encyclopedia Online. May 2007. Web. 20 Apr 2019. http://gameo.org/index.php?title=Albrecht,_Duke_of_Prussia_(1490-1568)&oldid=144683. Hege, Christian and Richard D. Thiessen. (May 2007). 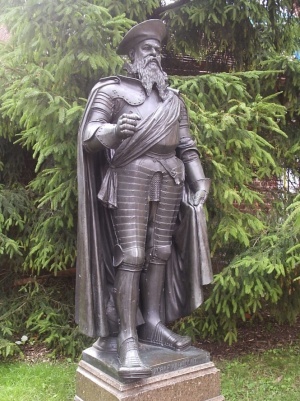 Albrecht, Duke of Prussia (1490-1568). Global Anabaptist Mennonite Encyclopedia Online. Retrieved 20 April 2019, from http://gameo.org/index.php?title=Albrecht,_Duke_of_Prussia_(1490-1568)&oldid=144683.